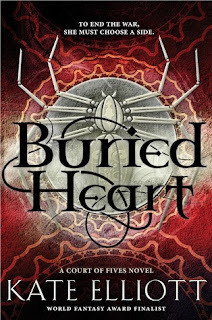 Welcome to the blog tour for Buried Heart by Kate Elliott! I've had the privilege of reading this conclusion novel early, and I'm so excited to share my review with you. 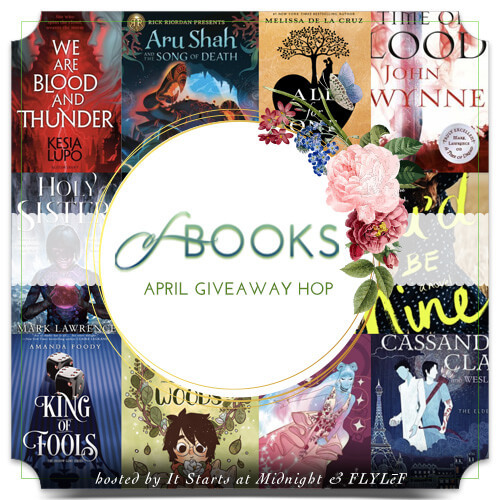 Don't miss this thrilling and unique YA fantasy series! 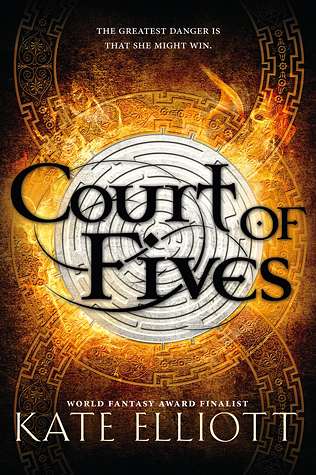 When Court of Fives appeared on the YA scene in 2015, there were mixed reactions and mixed reviews. I wasn't sure I wanted to read the book, but I decided to go for it when I received a copy for review. 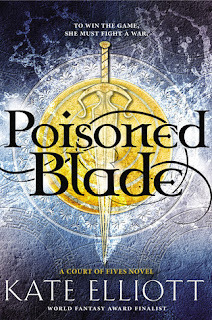 I was pleased when I found that I enjoyed the book, and the next year, I really liked Poisoned Blade. Kate Elliott's storytelling has been solid and consistent throughout this trilogy - as one would expect from such a talented and successful author. I'm glad I took a chance on each book. This conclusion novel begins with Jessamy, Kal, and others seeking safety from Nikonos, who has declared himself King. A revolution has been set in motion, and sides must be chosen. 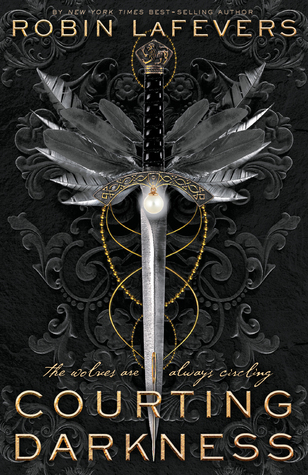 Kal finds himself in a position he never wanted - claiming the throne as king - and Jes finds herself looking for ways to unite Commoners and Patrons, Saroese and Efeans. Old prejudices and hatred die hard, and danger for both Jes and Kal is everywhere. Forced apart, can they unite under the same goals? Or will the war tear them apart as they fight on opposing sides? Everything comes to a halt in this conclusion novel, with a finale you won't see coming. I'm going to try to be as vague as possible so I won't spoil anything for fellow fans of the series! In short, this book was action-packed, a little angst-ridden and heartbreaking, and in the end, very uplifting. Elliott took me through a full range of emotions, whether I liked it or not. I'll start with the romance since it's fresh in my mind and it is a big part of the story. I was worried, because the synopsis makes it seem like there won't be a good ending for Kal and Jes. It makes it seem like they will grow apart. I will say that Kal and Jes do get separated in this book, in the physical sense. Emotionally, however, they are always close and love each other. It hurt to see them doubt each other and doubt the strength of their relationship, but politics and safety are what drive them apart (physically). This is the root of the angst that I mentioned. Still, I liked the romance, as weird as that will sound from me. Kal and Jes needed that time apart to realize that they don't want to be apart. Kal had to make difficult choices, and Jes had to consider her options. In the end, both make the right choices and there is a positive ending for each of them (and both of them). A touch bittersweet, but extremely positive (I promise!). In terms of their relationship, they get closer physically, and emotionally too. I liked that they took things to another level and even with the distance between them, they never grew out of love. Jes is as sturdy and strong as an anchor, in this book. She is a kickbutt heroine with a lot of punch that she is packing, and she is not afraid to charge forward without asking permission. She is fearless and selfless, a dangerous combination but one that makes her strong. She frustrated me a few times, but I understood her. I adored Kal, even when he also frustrated me. Kal hated being put in the position of claiming the throne, and part of him blamed Jes. Kal grows into the role, but it's always clear that he doesn't want it. Kal had so many tough decisions to make, and none of them involved a happy ending for him, but I liked how the author made it work for him. Kal does get a happy ending, after all of the suffering he has gone through in this series, and that makes me happy. He is a good guy with a good heart and a strong set of morals. This last piece of the story is incredibly action-packed and does not lack high stakes, tension, and uncertainty. A lot of time passes in this book - months at a time, weeks at a time, etc. Jes's sister Maraya is pregnant in the beginning of the story, and she has her baby towards the end of the story, so that gives you an idea of how much time passes. It's a long book with a lot of time passing but it doesn't feel like a long book. I flew through this one! There are a lot of complexities to this story, like the topic of race, the politics surrounding race, family bonds, and even some magic. Family is a big part of the story - Jes's family is a little dysfunctional, but she loves her parents and her siblings. The magic in this series has always been a little mysterious, but it has its purposes and I'm glad for its existence. If there is one thing about this series that makes it stand out in YA lit, it is the world-building. I've not read any YA series quite like this one. Yes, many YA fantasy series tend to sound the same after a while. This series impressed me from the start, with the world-building. This world is one full of sexism and the regression of women's rights, as well as racism and its obvious impact on politics and the law. There is some Ancient Greece influence in this setting. Even though Jes won the Fives in book one, the Fives races come up in the subsequent books. This series' world is incredibly unique and thought-provoking and very well-constructed. I'm trying to be vague, but in terms of the ending - it's a good ending. It's better than I expected, because I was expecting something really heartbreaking. The ending is uplifting and sweet, with a tough of bittersweet. I'm glad Elliott chose this ending and not another less liked type of ending. 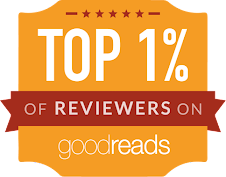 Otherwise, you'd probably see a 1- or 2-star rating from me. No matter how good the majority of the book is, if the ending is poor (for a conclusion novel especially), my rating of the book plummets. Overall, I was pleased with this finale. The plot worked for me, the pacing as great, the romance was a little angst-ridden but very realistic and swoony at times. I thoroughly enjoyed the series! I would have loved for the romance to be completely angst- and drama-free. There isn't much drama, but a tiny bit is there, and there is a lot of angst (with Kal and Jes being separated by a great distance, and for quite a bit of time). No love triangle, though there is an annoying boy who is infatuated with Jes (don't worry, no love triangle). I would have loved more swoons and kisses and whatnot between Kal and Jes, but I also see why the author had them separated in this book. It made sense. But still. I liked this conclusion novel a lot and definitely recommend it if you have read the previous books. This is a series worth finishing (something I struggle to do at times). I've not read any of Elliott's adult fiction books but I'm sure fans of her adult work would enjoy this YA series. This trilogy is one of the more unique series in YA that I've read - you've got to experience the world-building for yourself, to know what I mean. It's a great series to binge-read! 4 stars. If the romance had been a little more swoony and less angst-ridden, I would have given this book 5 stars. It was a thrilling conclusion, with plenty of action, lives lost, and sacrifices made. Not to mention some swoon between Kal and Jes. Kate Elliott gave this series an excellent ending and I'm glad I finished this series. Great review! 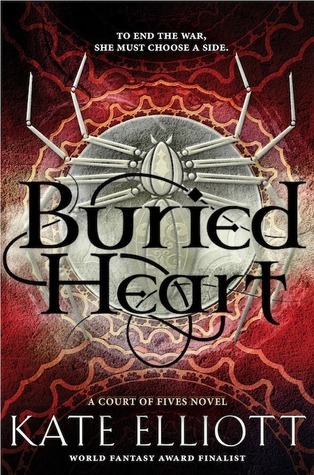 I haven't read this series yet, but it is on my TBR list. I like that the conclusion novel worked! Great review! I love the covers on this series and it sounds like an interesting read. Thanks for sharing! I don't know why but I've never heard of these books before? They sound great, though! Great review! I'm so excited to read this series if it finishes so well with lots of action and romance too. I haven't read any of this series yet but I am glad you enjoyed it. Maybe I will fit it in someday. I absolutely love Kate Elliott's adult fiction, but for some reason I haven't jumped into this series yet. Clearly that's a mistake on my part, because from what you've said this sounds awesome! Elliott's ships are always solid, and I love the triangle-free element. Throw in an uplifting yet bittersweet ending, and I'm sold! Can't wait to be the stop! Great job, Alyssa! !